As you know, Adobe’s Dynamic Tag Manager (DTM) is being replaced with Adobe Launch. That doesn’t mean the platform will be shut down anytime soon, but it does mean you should consider migrating your implementation to Adobe Launch in the near future. 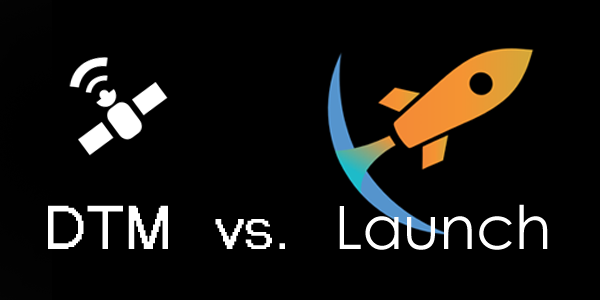 One question you’ll want answered before migrating is: “What’s the difference between Adobe Launch vs. DTM?” The short answer: A lot… and at the same time not much. The concept of Web Properties did not change between DTM and Launch. Adobe Launch adds some depth to the approval workflow process. Adobe Launch offers greater flexibility of access to various environments. Adobe Launch is infinitely extensible, allowing third parties to integrate their own tools into the platform. The Tagtician debugger supports both Adobe DTM and Adobe Launch. Both platforms support Page Load Rules, though there’s a little more nuance in Launch. Both platforms support Event Based Rules. Both platforms support Direct Call Rules. With just the Core extension, Adobe Launch supports 32 Event Types. More are supported with Extensions. Deploy a single rule based on multiple criteria, such as a Click OR Hover. With Action Sequencing, Adobe Launch enables users to Send and Clear analytics beacons without having to chain rules together. Adobe Launch introduces Rule Exceptions, eliminating the need for custom code or complicated RegEx. Decide WHEN actions within each rule take place. 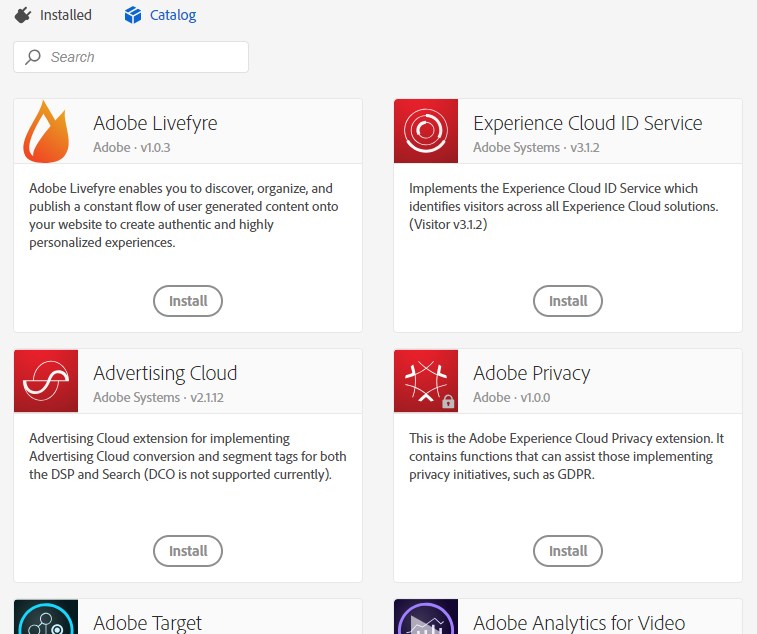 With just the Core extension, Adobe Launch introduces 5 new Data Elements, in addition to what is supported in DTM. Both platforms support Pageview, Session, and User storage lengths. Adobe Launch also supports “None”. Both platforms can host via Akamai. In Adobe Launch, you can choose to host one environment via Akamai and another via FTP. Both platforms can host via FTP. In Adobe Launch, you can choose to host one environment via Akamai and another via FTP. 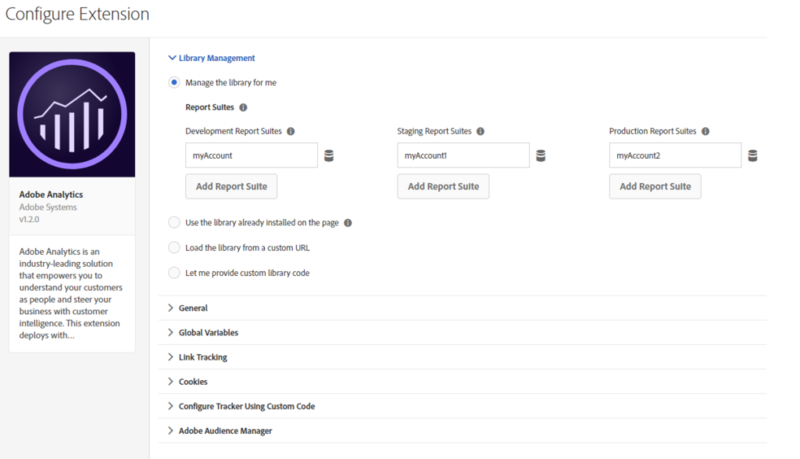 Adobe Launch adds support for asynchronous deployment of the page code. DTM only supports a Staging and Production environment. Launch supports unlimited environments. Things are different, but parts are similar enough to where if you are a seasoned Adobe DTM practitioner you’ll have no trouble picking it up. I wrote up a list in my Early Thoughts post from the 2017 Adobe Summit, but that was before I got my hands on the actual platform. If you were a power user of DTM, I recommend checking out the Adobe Launch Cheat Sheet for updated console commands and some technical comparisons. The concept of Companies and Web Properties remains roughly the same, at the moment. For each company, you still have a set of web properties. I have heard some folks close to the platform acknowledge the concept of web property inheritance. This concept suggests someone could create a parent web property that sets a certain framework of rules and then a set of children properties that inherit that of the parent. This is NOT a thing yet, though. It’s currently just a rumor that I am propagating… but would love to see that become a reality at some point! The image above roughly shows the menu differences between Adobe DTM and Launch. Embed options have split into 2 separate menu items… Adapters and Environments. This is because an Adapter determines where a library is hosted – which is totally different from defining what working environments your website has. Publishing consolidates History and Approvals. This makes sense because each time you approve something, you end up having to go to the History page to press the Publish button… despite Approvals/History both being part of a publishing workflow. Rules are split out into Rules and Data Elements. This was done because… you know… Data Elements are not rules. Extensions were added to Adobe Launch, arguably delivering the biggest paradigm shift seen from DTM to Launch. To COMPLETELY trivialize it, Extensions are where you add and configure your analytics tools (you used to do that on the Overview page). If you want to build out rules in Launch like you do in DTM, you can. It’s the same… but different… but still the same. Event-Based, Page Load, and Direct Call Rules still exist but have been consolidated into: “Rules”. A page load is an event, a direct call is an event, and so is a click – so why not just select them from an “Events” list? Rules are now set up like an “If… Then” statement: “If this happens, then take this action.” This frames rule-building into a context we’re all familiar with (I hope). Pretty straightforward, right? 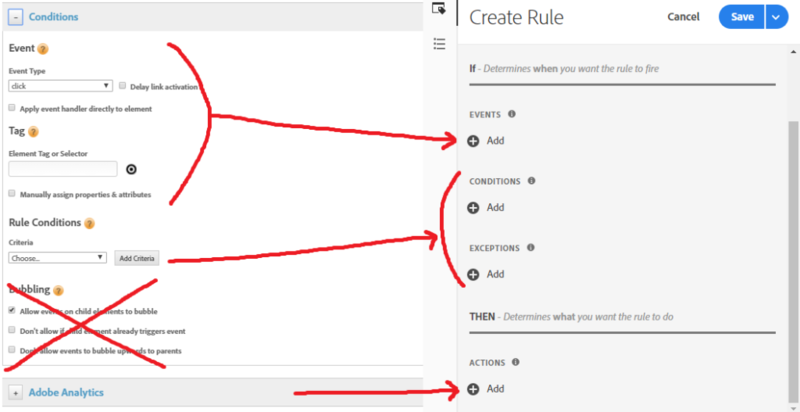 Events are set up under Events, Rule Conditions are set up under Conditions – there are now rule Exceptions which will make life a LOT easier for everybody (“I want it to fire everywhere except for [here]”). For the DTM users who remember toggling the “Apply Handler Directly to Element” settings, they’re gone: check out Aaron Hardy’s write-up on Medium for more details on that. Tool templates have been consolidated into “Actions”. That’s where you’ll configure Adobe Analytics, Target, Custom JS/HTML, etc. Like I said before – you can keep operating like you always have in DTM. However, there is some game-changing modernization that will make your life MUCH easier. With DTM, there’s no way to trigger something like a pageview on a single page app when the page loads OR when a URL history change event occurs. Adobe Launch solves this by letting you string together multiple event conditions. I can trigger the same rule based on any number of conditions. Note that there currently isn’t a way to toggle between AND & OR. You must use OR. Leverage Custom Conditions to create additional event dependencies. Not a whole lot has changed with Data Elements. Everything you did with DTM you can exactly replicate in Adobe Launch. Aside from Extension support, you’ll be reminded of the standard set of out-of-the-box options alongside a few new ones. The biggest update you’ll find is support for the “None” storage length option. Aaron wrote another good article on the “None” storage length option. In short, it better accommodates single page apps (which was a huge gap with Adobe DTM). This one was a little too big to do a side-by-side with DTM. Hopefully you get the idea. There’s much more depth to Extensions that I won’t review in this post, but I recommend you check out this article that goes into a little more depth. The basics of it are this – it’s like an app store where anyone can create an application for Adobe Launch that extends the platform to make your life easier… whether that is adding new Data Elements or custom Rule templates that leverage Launch’s UI (like a Facebook Pixel template or LinkedIn Insight template). There are loads of opportunities with Launch’s extension and it would take an entire article to scratch the surface. In Dynamic Tag Manager, everything is crammed into the Embed section. You have to decide whether you want to use Akamai or FTP for delivery. With Launch, you can choose Akamai and FTP for an implementation (choosing one for each environment). This is great because it lets you mix and match deployment methods! You can now use Akamai to host your implementation on any number of staging environments while your main code can be hosted locally. I have a write-up on Adapters vs. Environments to help you better understand what this means. Speaking of big changes – Launch gives you the option to load scripts asynchronously (but you don’t have to!). That means it will not block the rendering of your page! With Adobe DTM, you needed 2 snippets – header and footer. Implementing just the DTM header script would cause all sorts of wacky stuff to happen. If you choose to load your libraries synchronously (like you do with DTM), you’re still okay. There’s also a way you can load your Launch library into your DTM file – so you technically don’t even have to swap your code out. The best part about this new workflow is that the library builds as you progress through each phase. That means you no longer have to refresh the page for 15-20 minutes waiting for the library to update! Apologies to those who used that wait as a nice bathroom break. Adobe Launch is a different product architecturally, visually, literally… though it borrows all of the good metaphors from Adobe DTM. They’re different, but they also rhyme. I just skimmed the surface with this post, but if you’re having a tough time reconciling why you should switch to Adobe Launch – or whether you’re in for a lot of work – hopefully this gives you a good idea. Adobe Launch is still evolving and maturing their features. As they do, I’ll try to keep this post updated; but the fundamentals should remain. Very helpful. Thanks for the meaty content! One question I haven’t seen clearly answered though, is how much help we are going to get with moving a large installation of DTM over to Launch? I tend to mistrust any Adobe tool that is too new and I am waiting for more than excitement over features. Still, the async change alone is worthwhile. It is just kind of sad that it takes a whole transition to Launch to get what I would consider normal with other tag managers. Really shows how DTM started way behind the starting block to begin with. Hey Eric – Thanks for your comment! Good questions and also good points. Adobe is actively working on tools that will help migrate your implementation from DTM into Launch automatically (via back-end migration). With Tagtician, I hope to create some front-end utilities to load your rules into Adobe Launch. I’m certain there will be others, as well! I’m also very skeptical of new tools – but Launch feels like a complete tool. That said, there isn’t a reason to rush the transition. Adobe will support DTM indefinitely (their words). I’ll bet that a vast majority of Adobe customers will still be on DTM even by the end of 2018. In the meantime, keep an eye out and learn what you can from others’ mistakes before you migrate over! Jim, love your blog. I’ve been using your cheat sheets for ages! To throw in my two cents, I have done a migration and it literally took a day. It was basically a copy/paste exercise since I wasn’t changing any direct call triggers, or data element names or anything like that. The QA takes awhile because you have to regression test everything but the actual conversion over was easy. One thing I will note is organization gets much more important. Because all the rules are lumped together I created prefixes to help keep stuff organized. “DC – Rule Name” for direct calls “PLT – Rule Name” for page load tops and so on. I think once more extensions come on-board and better documentation around them arrives people will want to make the switch. Thanks Dave! 100% agree on all fronts. Once more extensions become available I think people will perceive that it will be in a better place to switch. In its current state, you can migrate everything as-is rather quickly, assuming your implementation is lean. Adobe is also working on a back-end implementation migration tool, which will hopefully ease anxiety of those who have larger implementations. Great post! This has a lot of good information for those like me who haven’t seen the launch interface yet. One of the biggest reasons that we may switch to launch is if there are page performance improvements. I wonder if anybody has compared the script loading times between the DTM and launch (with async). Thanks Seth! I’d love to see that side-by-side, as well. Hmmmmm… that’s a good idea – maybe I’ll do that. Looking forward for some more on launch. Thanks Kuldip! Admittedly, I have limited experience with AdWords integration with Adobe Analytics and the advertising analytics option. If i submitted the rules for approval in staging, now i wanted to add new rules in Dev , So i added and build for development. Now i am trying to push for stage but its showing “Already one build is waiting in queue”. Please suggest how to ad new rules to existing staging environment? Hey Gayathri, if I understand this correctly you’ll have to reject the staging build to send it back to Development before adding rules to it.